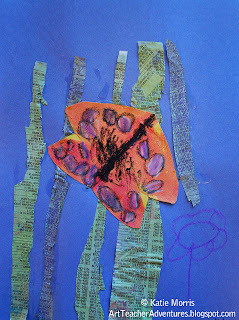 Back in the end of September/beginning of October I did a butterfly lesson with my Kindergarten students. 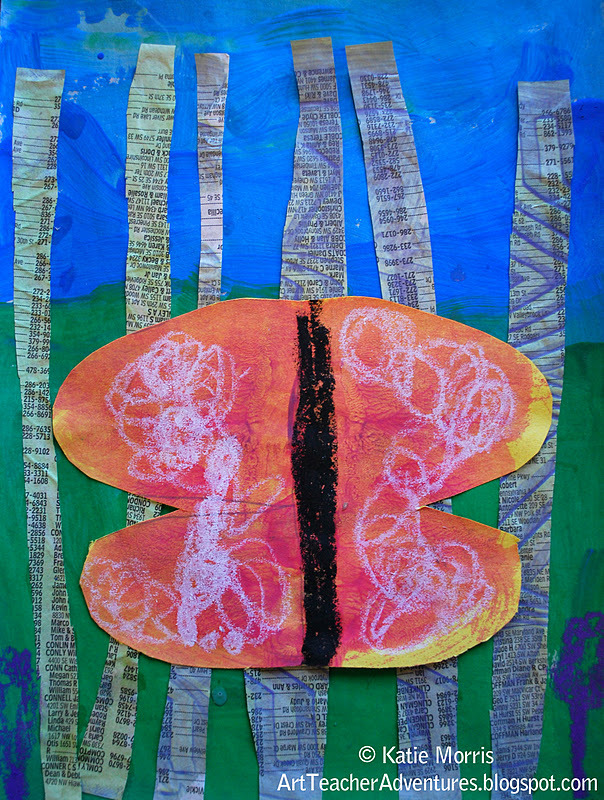 I had recently seen two different butterfly projects that inspired me and the timing was great since the monarch butterflies were really moving through Kansas. I even took a chrysalis to school and though we missed the butterfly actually emerging, the students were really excited to see a REAL butterfly! They named her Dotty. Now back to the lesson... My project was inspired by the following lessons. 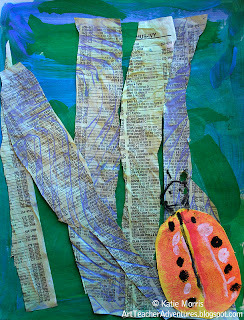 One from Artsonia, and one from There's a Dragon in my Art Room and her original inspiration was from Art Project Girl. This was a 3 class period project and while we managed, it was a bit stressful at times. 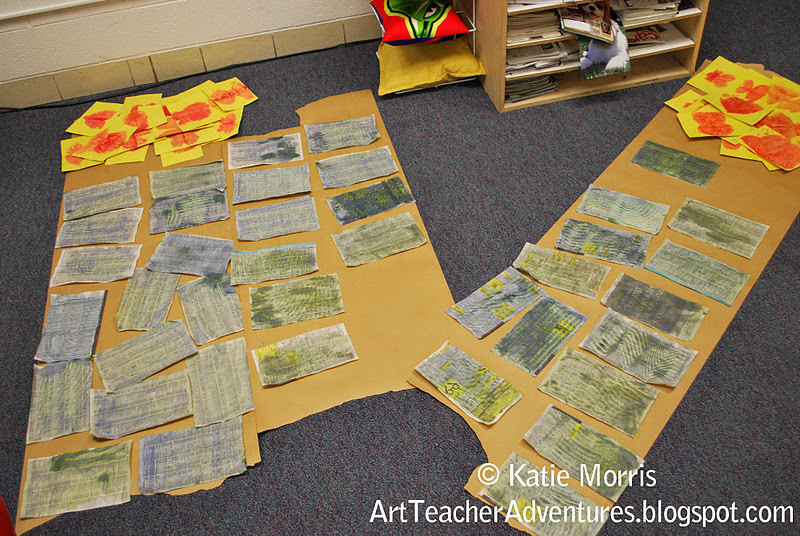 If I do this project again, (as-is, anyway) I would probably save it for 1st grade. It had a lot of good things to introduce- mixing colors, horizontal and vertical, cutting and gluing, etc., but it was a little too much for a lot of my Kindergarteners still fairly early in the year. 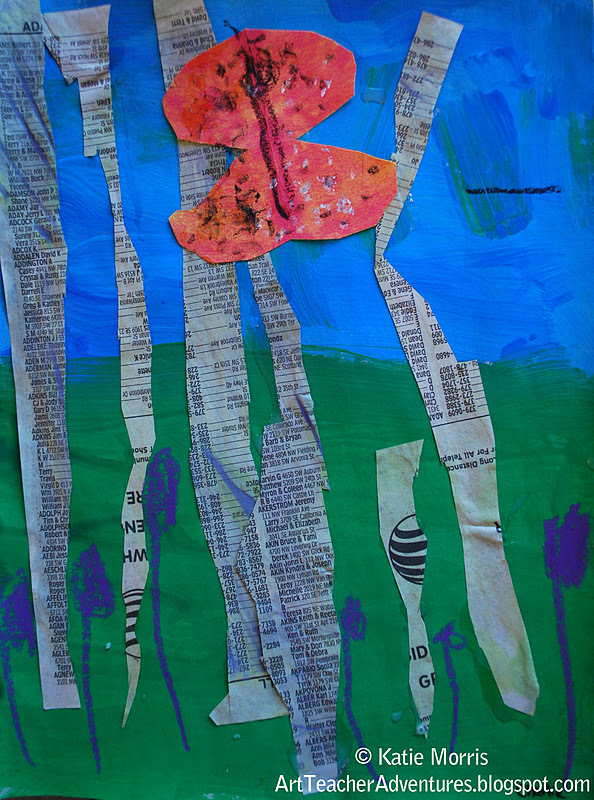 Class 1- Introduction to landscape, drawing a horizon line, painting blue sky and green grass. I projected some photos of landscapes to show the students and focused on pointing out the horizon line. I told them that the horizon line is where the sky comes alllll the way down to touch the ground. I knew that this would be a knew concept for most of them since I still have 5th graders occasionally draw the big empty space between the sky and the ground but something happened that I didn't expect. A little boy raised his hand and when I called on him he said "I don't believe you." It took me by surprise because usually younger students just eat up everything you say! As soon as he said that other students saying they didn't believe. Luckily I have some big windows in my classroom so I pulled up the blinds and had one table at a time come look outside so I could PROVE that the sky comes down to touch the ground. The rest of the first class was painting the grass and the sky. We had to put papers on the floor to dry. I have since purchased an additional drying rack and some cheap closet shelves. Class 2- Mixing yellow and blue paint to make green, painting phonebook pages and adding texture, mixing red and yellow to make orange, turning "B"s into butterflies. I gave each student a half piece of yellow construction paper folded in half. I wanted to have them paint a "B" on one side that would be painted and folded to print on the other side ensuring a symmetrical butterfly. To get all the students to put their B on the correct side, I had them fold their paper "like a book". I demonstrated how to write a capital letter B and the students wrote their letter on their paper in pencil. I checked each one to make sure it was on the fold not the open side then had them open their "books." 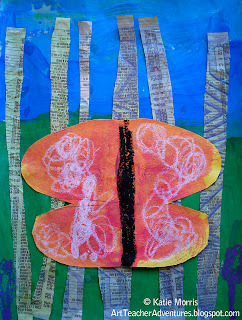 Next I showed how to paint mixed orange tempera paint inside the B, fold, and press to transfer paint to the other side. 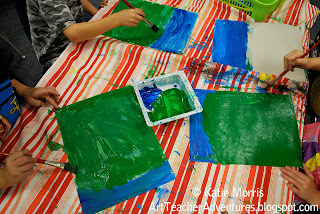 Next we mixed green paint and used texture combs that would later be turned into grass. 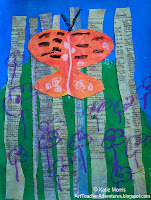 I had painted on newspaper before but decided to try phonebooks because I always see people trying to get rid of them. It worked OK but the paper was flimsier than newspaper and curled a bit when dried. 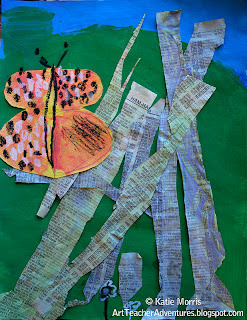 Class 3- Review horizontal and vertical, cutting phonebook pages into strips, gluing "grass" to background, cutting and gluing butterflies on top of grass, turning butterflies into Monarchs with black and white oil pastels, adding purple flowers with oil pastels. 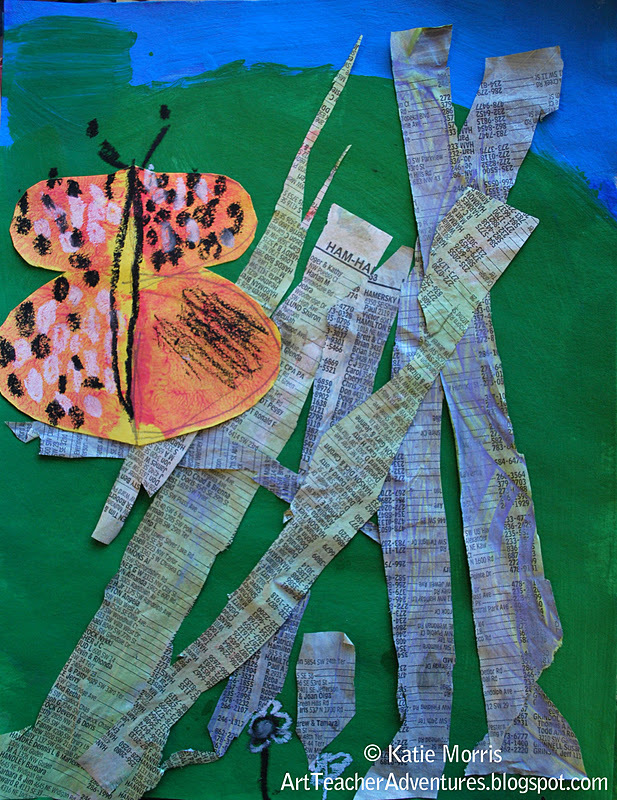 I was amazed at how many kids cut their butterflies in half (and at how many different ways they discovered to cut the butterflies in half) but I just tried to show them how to make the pieces touch when they glued them in place. 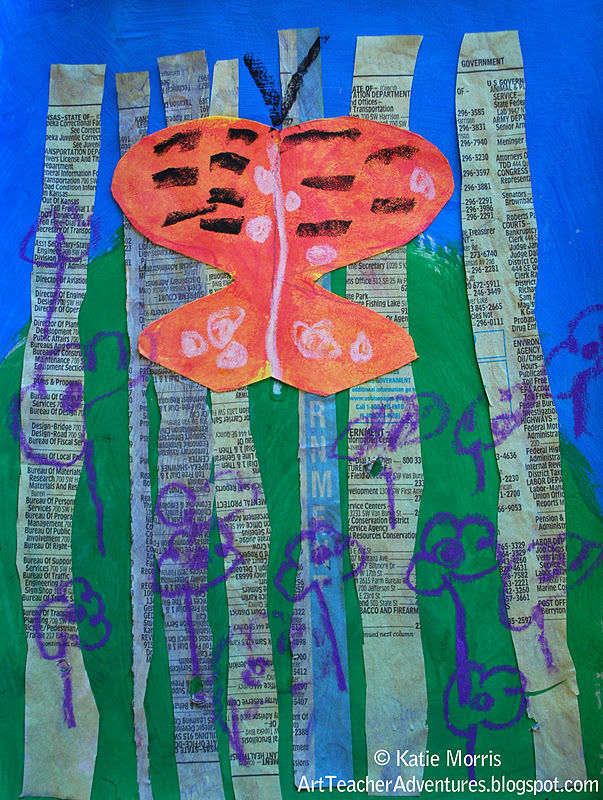 I reminded the students how monarch butterflies are orange with black and white designs and if there was time, the students used oil pastels to add details to their butterflies. 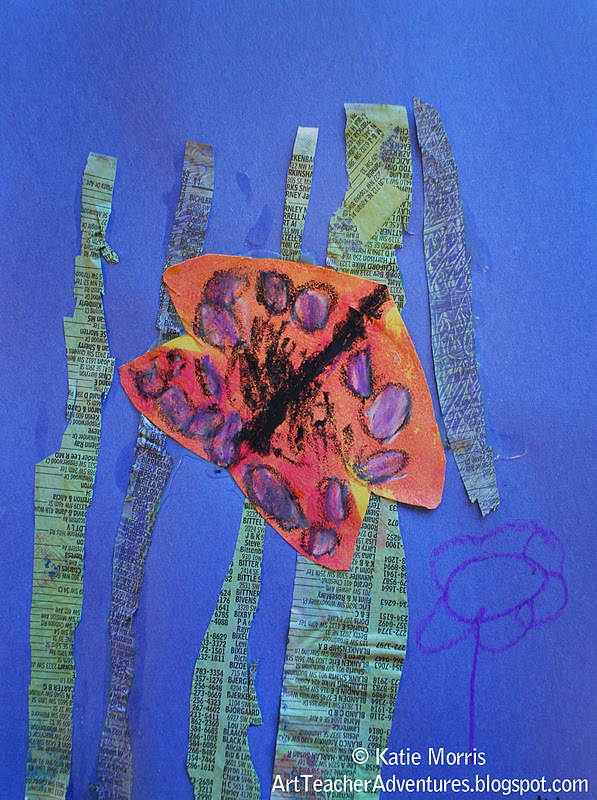 Then if there was STILL time, I reviewed secondary colors and the students used purple oil pastels to add flowers. Student who missed the 1st class used solid blue for the background. Stray ladybug hanging out with the butterflies. 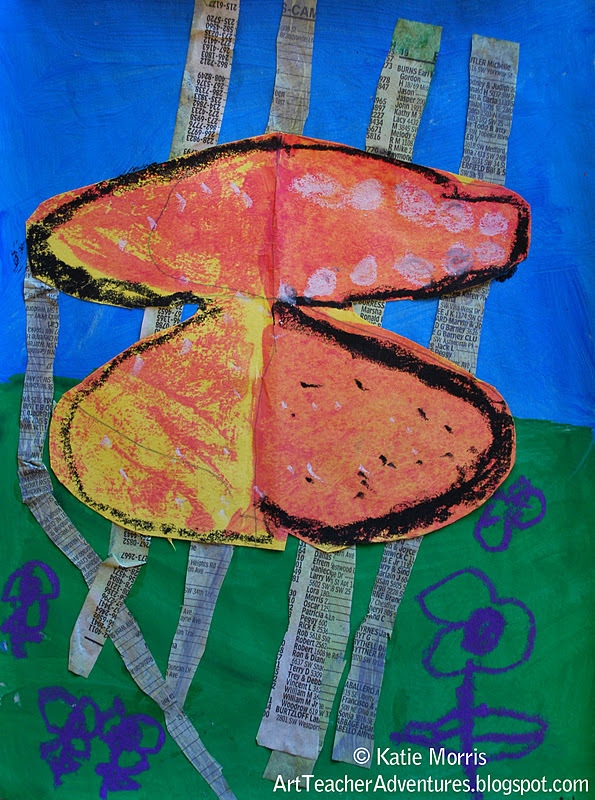 You can view more examples in our Artsonia exhibit. I absolutely love this project even though it took a bit of work. Your post made me laugh. Aren't kids funny! If you don't mind, I would love to try this out with my kids. Thanks Anna. Thank you for the description! 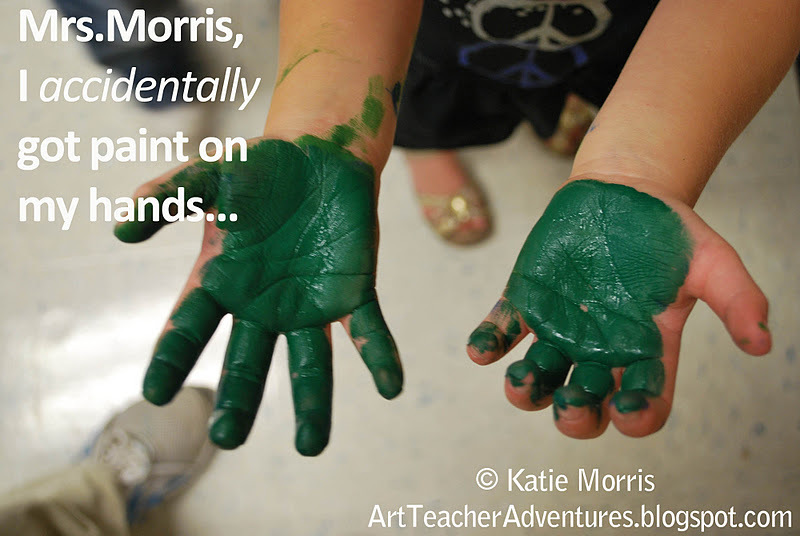 I am new to teaching Kindergarten art, and reading about what was successful and what was complicated is so helpful to me!! !